The mechanical engineering aspects of this project are ridiculously low-level: even every single gear is custom designed, machined, and manually cast in my home workshop. 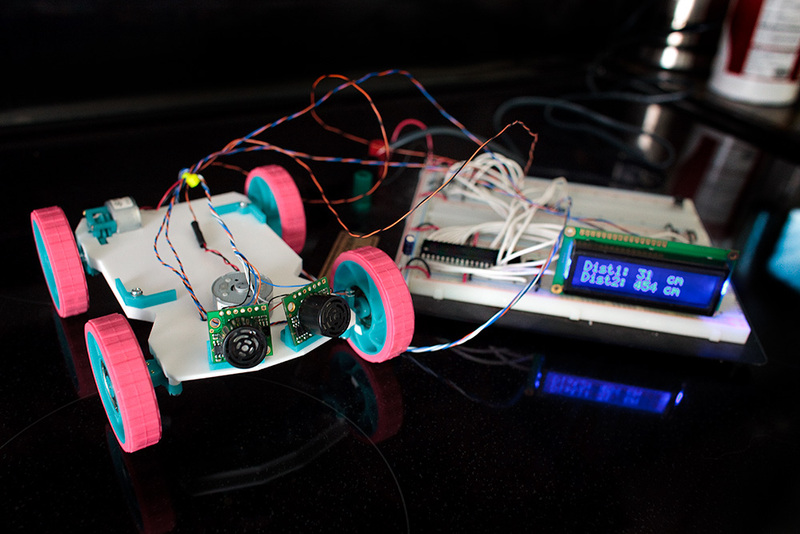 The electronics are cheap, easy, power-efficient, and extensible. The total cost of the robot is $30 if you count just the essential parts, and $90 including a pretty LCD and two fancy distance sensors. Most of the comparably featured projects on the web are several times more expensive. I am trying to make it look pretty, so it's purple. In other words, enjoy your stay. Supply adjustment: Murata OKR-T3-W12-C ($6.20). ...plus several resistors, capacitors, switches, etc ($3.00). 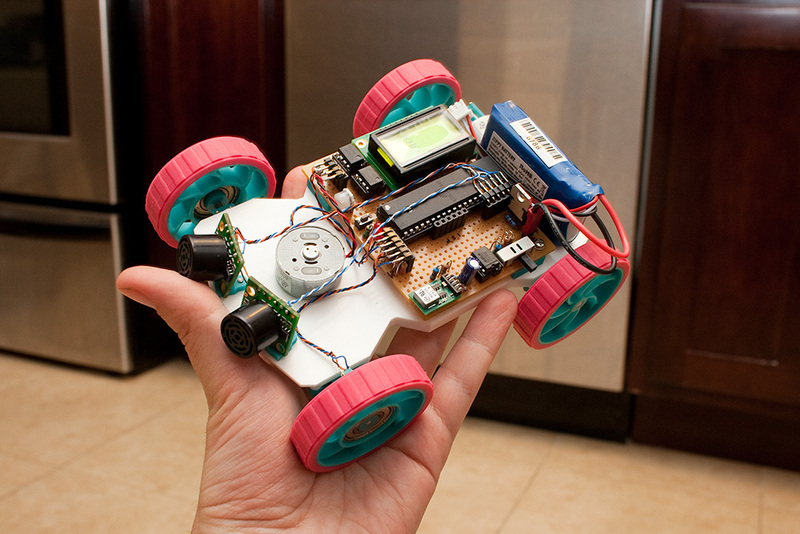 The resulting robot is a GCC-supported, libc-enabled compilation target running at up to 20 MHz, with 128 kB of program memory and 16 + 4 kB RAM. It is equipped with stereoscopic distance vision, traction control, has good dead reckoning capabilities, and features very low power consumption, thanks to motors running near their maximum efficiency (approx. 35 mA per motor). Molds for all plastic parts were initially machined on Roland Modela MDX-540 in Huntsman RenShape 460 medium density modeling board. Negative molds and tires were then cast in ShinEtsu KE-1310ST platinum cure silicone, and all the remaining final parts - including around 15 spur gears - were made out of Innovative Polymers IE-3075 polyurethane resin, manually pigmented with quinacridone pink, titanium white, solvent blue 67, and solvent yellow 146. The project also called for four VXB ball bearings, 16 steel dowel pins (M1, M2, M3), 30 machine screws (M1.5, M2), and one square steel rod. 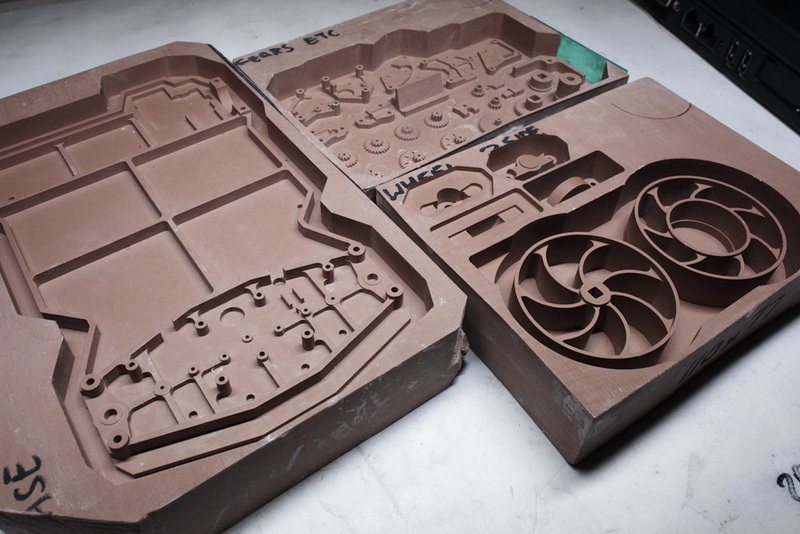 The whole machininng and casting process is explained in painstaking detail in my guerrilla CNC manufacturing guide, and also illustrated on this Flickr page (an earlier project of mine). 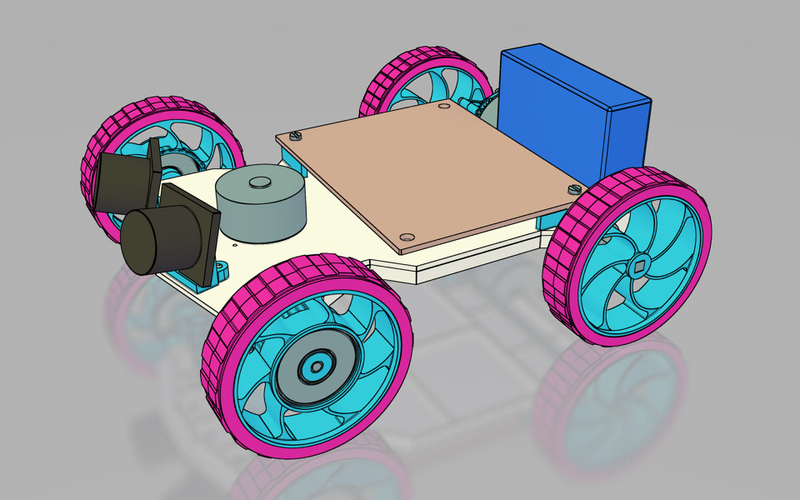 External dimensions of the robot are 15 x 12 cm; ground clearance is 2.7 cm. With a battery installed, it tips the scales at 275 grams. Front wheels have integral ball bearings and rotate freely; a reflective optointerrupter, TLP841, is used to provide traction feedback for the motor, detecting a small white target on the inside of the wheel. 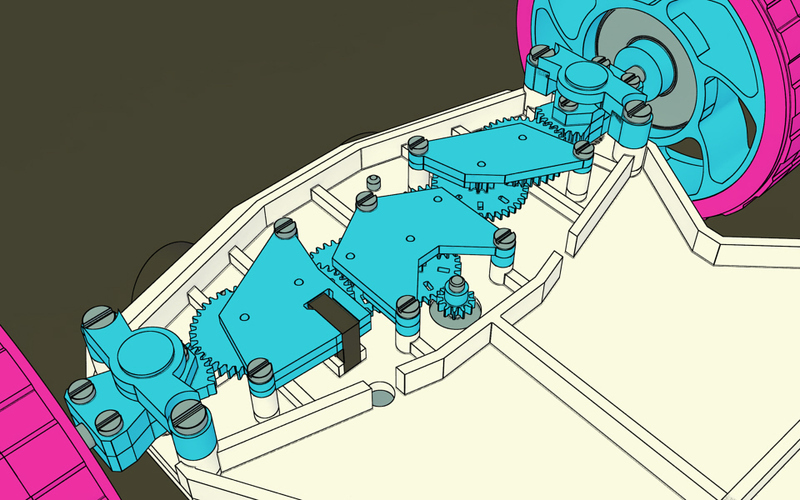 Gear tooth size is about 0.5 mm, pressure angle is about 18° for initial stages, and 25° for the final stage in the steering assembly. 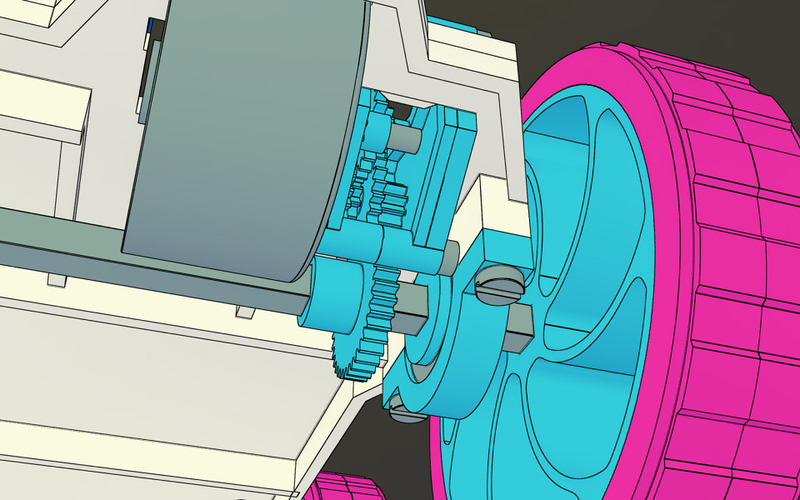 Gearwheel thickness is 1 and 1.75 mm, respectively (see the aforementioned CNC machining guide for a good primer on gear geometry). Other images of interest: initial prototype two months ago; and the immediate predecessor to this version (note a different orientation of the motors). If you count these iterations, the project took about 25 hours of work to get to the current stage. The robot uses a lightweight, two-cell 800 mAh lithium-polymer battery; this choice yields a continuous running time of 8 hours with LCD backlight turned off, or 4-6 hours when the backlight is on (depending on the desired brightness). The battery has a nominal voltage of 7.4V (the actual range is 5.6 - 8.5V); this needs to be translated to stable 5V for the motors, sensors, and the microcontroller. To do this, I used Murata OKR-T-3-W12-C, a high efficiency 3A switched regulator. The voltage is set with a 270 Ω resistor; the value needs to be set accurately, so a 500 Ω trim pot may be more practical than shopping for a 1% resistor of this exact value. 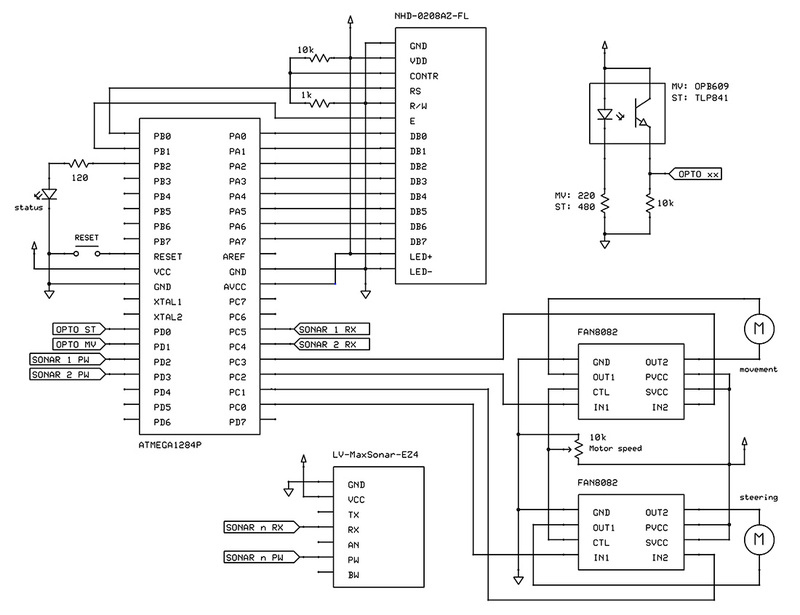 An extra 10 µF capacitor across terminals is employed to counter motor inrush currents and the crowbarring tendencies of the H-bridge drivers used, so that the risk of resetting the MCU is minimized. To avoid damaging Li-poly batteries, care must be taken not to discharge them below about 2.8V per cell (5.6V total). To prevent this, I rely on a MAX8212 voltage monitor, coupled with a medium power p-channel MOSFET transistor (STP12PF06 in this case, but any other rated for at least 3A will do). 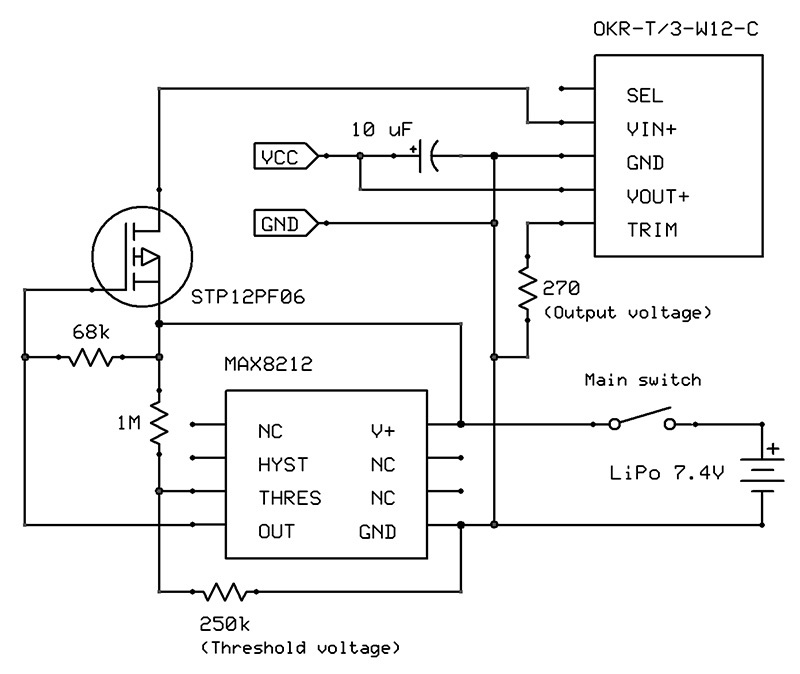 This serves as an input stage for the regulator; the threshold voltage is adjusted with a 250k resistor. This value also needs to be matched accurately, so a 220k resistor and a 50k trim pot may be a simpler choice. An HD44780-compatible LCD (NHD-0208AZ-FL-YBW) in 8-bit write-only mode (R/W pin pulled low) for displaying status messages and offensive ASCII art. Backlight brightness can be adjusted by adding an extra 500 Ω trim pot on the LED+ pin. Two narrow beam ultrasound distance sensors (MaxSonar-EZ4) used in one-shot mode with pulse width output. The range for these devices is about 15 cm to 6.5 m.
Two FAN8082 H-bridge controllers for the motors, with speed control using a trim pot. FAN8082 is being phased out, but Toshiba TA7291P or ROHM BA6956AN are good substitutes. Basic support circuitry for the optointerrupters to limit LED current, and convert phototransistor output to CMOS levels (on the schematic, "MV" stands for traction sensing, "ST" for steering). Not shown on the schematic, the AVR ISP connector is also attached to pins 6-11 of the MCU to allow for easy programming. 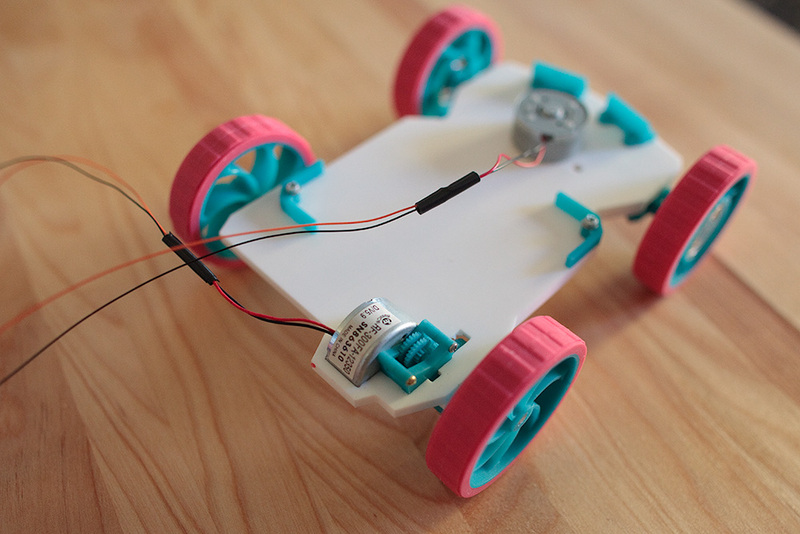 The above video shows Tinybot executing a test program; sensor feedback is used to execute movements very precisely. After a couple of functional tests, I proceeded with more useful routines to explore and map out the environment - but ultimately decided that traditional steering limits the ability of the robot to efficiently explore indoor environments without resorting to uninspiring Roomba-like motion patterns. The problem is compounded by the use of EZ4 ultrasonic sensors, which in hindsight have an overly narrow detection pattern; EZ2 sensors appear to be a better fit. This could be remedied by upgrading the MCU and equipping the platform with a video camera or a larger array of better-suited distance sensors - but ultimately, I decided to move on to a completely different, more agile design - dubbed Omnibot.